On the day (June 10, 1999) that the media of the world were trumpeting the end of the war in the Balkans and the signing of a peace treaty, the beginning of week-long celebrations surrounding another peace treaty went virtually unnoticed in the world outside. After 1,225 days of political impasse in Zanzibar, an agreement, put together by Commonwealth Secretary General Chief Anyaoku and his negotiator Dr Moses Anafu after four years of effort, was signed between representatives of the combative political parties in the Isles -Mr Khatib Hassan, a member of the National Executive Committee for the ruling Chama cha Mapinduzi (CCM) party and Mr Shabaan Mloo, Secretary General of the opposition Civic United Front (CUF) for his party. Special prayers were read at the ceremony in the House of Representatives and seven white pigeons were released. A multitude of guests attended a dinner in the evening and heard President Amour say: “I can now welcome to State House my old friend Maalim Seif (a term of affection for Seif Shariff Hamad, the CUF leader) for a bottle of soda, a cup of coffee or even haluwa. In a convivial atmosphere he added “You and I understand each other, CCM and CUF understand each other, let us build the nation patriotically”. Chief Anyaoku, who was given honorary Zanzibar citizenship said in his speech that Zanzibar was now ‘the real pearl of Africa’. He pointed out that the whole object of the agreement was about both parties putting the past behind them. The CCM and CUF realise that there is a POLITICAL IMPASSE in Zanzibar. They also realise that if the impasse is allowed to continue it will exacerbate social divisions, retard the orderly socio-economic development of Zanzibar and undermine its nascent democracy. CCM and CUF have therefore agreed to work together in the spirit of national reconciliation to consolidate democracy in Zanzibar, promote human rights and good governance and ensure that future elections are free of controversy and that the will of the electorate will be respected. The JUDICIARY of Zanzibar is to be reformed to enhance its independence, its professionalism and its standing in the eyes of the community as the fount of justice. The exercise should involve consultations between the Government, the judiciary itself and the legislature. Since the elections of October 1995, there have been allegations and counter allegations of abuses of HUMAN RIGHTS, of properties damaged or destroyed for political reasons, of civil servants demoted or dismissed on political grounds and of students denied scholarships. Accordingly, the President will appoint an INDEPENDENT ASSESSOR to establish the validity of the claims of those who allege that their properties were destroyed or damaged and make recommendations on the nature and scope of Government assistance to those deserving assistance. The President will also appoint a small COMMITTEE OF RETIRED SENIOR CIVIL SERVANTS to look into the claims of civil servants arbitrarily dismissed or demoted and students whose scholarships were either withheld or denied and recommend appropriate redress. In the case of the allegations about human rights abuses, the parties agree that these matters properly belong to the courts of law. To facilitate the expeditious resolution of all these claims, the Government has agreed to establish a FUND FOR RECONCILIATION AND RECONSTRUCTION within an appropriate Ministry. The parties agree that the ending ofthe impasse calls for the RESUMPTION OF NORMAL POLITICAL LIFE. Accordingly, the CUF MP’s will resume their seats in the House. The parties also agree to refrain from inciting ethnic hatred, hostility and political intolerance. For his part, and in the same spirit, the President has agreed to appoint two new members into the House of Representatives from the ranks of CUF. This will increase CUF numbers to 30; CCM has 45 MP’s in the House of Representatives. The parties agree to the establishment of an INTER-PARTY COMMITTEE (IPC) composed of CCM and CUF MP’s. It will have no constitutional or legal status but will play a useful role in NATIONAL RECONCILIATION through the promotion of dialogue and the fostering of mutual confidence between the parties. The IPC will facilitate the implementation of this Agreement. Zanzibar has already begun to reap the benefits of the agreement. Donor agencies, most of which had stopped aid to Zanzibar because of doubts about the fairness of the last elections and allegations of human rights violations, indicated that they would soon resume aid. Tanzania and Zanzibar have received congratulations from many countries. OAU Secretary General Salim Ahmed Salim saluted the high standard of political maturity shown by leaders of both sides in the dispute. US Ambassador Rev. Charles Stith visited President Amour to congratulate him on his leadership and political courage. On May 19 Sweden announced that it would be resuming aid but Norway said that it would resume aid to Zanzibar only after the 2000 elections and if they were free and fair and if the 18 treason suspects (see below) were treated fairly. Political analysts have been trying to work out what had made the two leaders Amour and Hamad finally embrace after such a long and bitter confrontation. Both parties have gained something. CCM is happy that CUF finally recognises Dr Amour as President of Zanzibar and has ceased its boycott of the House of Representatives. CUF is happy about the proposed reform of the much criticised Electoral Commission and the Judiciary. The agreement lacks a precise timetable for the various actions proposed and much goodwill will be needed if it is to be implemented successfully. The approach of the next elections was certainly one factor favouring agreement especially as CUF needed a reformed Electoral Commission if it were to have a chance. CCM has gained in confidence that it will win again. There has been also continuous pressure from donors. Tanzania has decided to withdraw from the 22-nation Common Market for East and Southern Africa (COMESA). The Guardian reported that Minister for Industry and Commerce Iddi Simba, had announced on July 2 that, after some research, the country had decided to withdraw because of COMESA’s proposal to reduce customs tariffs for member countries by 90%. The first sign of this move had been a speech by President Mkapa at the meeting of COMESA Heads of State in Nairobi on May 25 when he said that it was unrealistic to expect the planned tariff arrangement to occur in October 2000 as envisaged. The development levels of member countries were too uneven he said. A further indication of what many see as increasing protectionist sentiment in Tanzania was the recent announcement that the signing of the much heralded East African Community Treaty which was scheduled for July 30 would be postponed until October. Preparatory negotiations which extended to 12 days (Tanzania’s delegation totalled 25 people) apparently revealed fundamental differences between the three parties on the major sectors of tourism, trade and industry. Negotiators were said to have been preoccupied with safeguarding their national interests. Contributing to the delay had been a study report issued on June 22 that had recommended the setting up of a ‘Preparedness Unit’ to improve Tanzania’s role in the proposed community and stating that the reduction of tariffs should be phased in slowly. However, on August 12, Foreign Minister Jakaya Kikwete was quoted in the Daily News as stating that Tanzania was as committed as before to signing the treaty before the end of this year. There have been four significant developments on the political scene since the last issue of Tanzanian Affairs. Prominent activist Augustine Mrema changed his political allegiance again; two by-elections in Dar es Salaam on July 11 gave results which could indicate important new trends; the government decided to stop providing subsidies for political parties and Minister of Commerce and Industry Iddi Simba hinted that Tanzania now had a ‘replacement’ for the Arusha Declaration. The Chairman of what was the most significant opposition party, the NCCR-Mageuzi, Augustine Mrema, who stood for the presidency of Tanzania in 1995 and never fails to spring surprises, announced that he was leaving the party and had become Chairman of the previously insignificant Tanzania Labour Party (TLP). His relations with the NCCR party’s MP’s and its intellectual wing had clearly deteriorated beyond repair. The NCCR leadership and several existing leaders of the TLP (a party which had now acquired not only Mrema but also many of his followers, some of whom immediately took up executive posts in the TLP) objected. Some described Mrema as a ‘political refugee’. The High Court ruled that Mrema could not become chairman of the TLP as normal electoral procedures had not been followed. He then became known as the Acting Chairman. By changing parties Mrema automatically ceased to be an MP (for Temeke in Dar es Salaam) and when the by-election was announced indicated that he would stand for his old seat. At this, the NCCR again went to court and Mrema was barred from contesting the Temeke seat. The Registrar of Political Parties said that the sudden changes in the leadership of TLP were unconstitutional. The Vice Chairman of TLP (Mainland) and the Chairperson of the Women’s wing then filed an application to the High Court and, on June 13 the Court issued an interim injunction interdicting the Acting Chairman of TPL and his fellow defectors from holding any office in the party. A wise NCCR MP, who did not give his name, in an interview in the Guardian, admitted that the defection of Mrema had left NCCR in a shambles. He criticised the government for treating Mrema as an arch enemy and barring him from holding meetings. The more the government tried to intimidate him the more popular he became. Another NCCR member was quoted as wondering whether the NCCR could survive without Mrema. A CCM member said that Mrema had been a crowd puller and an orator but he lacked some of the basic qualities of leadership. Mrema tended to find most advice unacceptable, made rash and haphazard decisions and was too inflexible to lead. CUF supporters were unhappy with these results and suspected corruption. Seventeen CUF supporters were arrested following rioting, attacks on CCM offices and destruction of CCM cars in Temeke after the results were declared. The last time Temeke was fought over in a by­election, in October 1996, the NCCR’s Augustine Mrema had won the seat convincingly with 54,840 votes against CCM’s 33,113. What happened to the NCCR voters this time? According to Mrema a lot of them stayed at home in protest at the refusal of the Electoral Commission to allow him to stand. The surprising strength of CUP can be explained by the collapse of the NCCR and the influence of Zanzibar and its Muslim religion. Many Zanzibaris live in the two constituencies. Needless to say Mrema could not conceal his glee at the humiliation suffered by the NCCR party now that he was no longer its leader. “They have reaped what they sowed” he was quoted in the Guardian as saying. There are many lessons for all politicians to learn from these results. Firstly, the opposition must unite if it is ever to beat CCM. Secondly, although it has been dealt a body blow by the collapse of the NCCR, opposition still exists and Mrema still has many loyal supporters willing even to change parties in order to vote for him; if any opposition party could find a popular and generally acceptable leader, it could do well in the 2000 elections. Thirdly, although CCM must be happy in that it now holds every seat in Dar es Salaam, it must be aware that it is still not in the totally dominant position in urban areas that it enjoys in most rural seats. Tanzania’s smaller parties received a shock in mid-June when Prime Minister Frederick Sumaye announced that the government would not continue to provide subsidies to parties for the elections in 2000. The reactions, quoted in the Guardian on June 19, were swift. CHADEMA party chairman Bob Makani, said that by deciding doing this the government hoped that CHADEMA would not be able to participate. “Despite everything, we will take part” he said. TLP Acting Chairman Augustine Mrema, said that the government intended to kill the opposition. “They know that if they give us subsidies, we will defeat them” he said. However, CCM MP for Mwanza Rural Antony Diallo, praised the decision. He said that subsidies were given during the previous general elections because the opposition parties were participating for the first time. If they had not put funds aside for the coming election it was their own fault. There could be compensations for Tanzania, apart from the saving of money, from this decision. It is likely to kill off many of the smaller parties and encourage the others to work together to survive. CCM MP for Bukoba Rural Sebastian Kinyondo has lost his appeal against a High Court Order which unseated him last year. He had got 42,169 votes compared with the candidate of CHADEMA’s 10,116 in the last elections. Commerce and Minister Iddi Simba, who is gaining a reputation (and considerable popularity) for his strong support of indigenous African business enterprise in Tanzania was reported in the Daily News on August 12 to have told the press that his new indigenisation policy was intended to empower indigenous Tanzanians to take an active role in the management and control of the country’s economy and not to divide them on racial grounds. 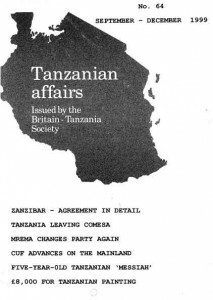 He was quoted in the Guardian as saying that the policy was a replacement of the obsolete 1967 Arusha Declaration, the blueprint for Tanzania’s earlier policy of socialism and self-reliance. In the latest measures taken against corruption, 14 members of the Tanzania Peoples Defence Force (TPDF) including four senior army officers were sacked following illegalities in recruitment procedures that had taken place last year. Some 12 National Insurance Corporation (NIC) employees were arrested and locked up in the Dar es Salaam Police Station when it was found that some of them were planning to destroy documentary evidence held in a local bank. According to the Daily News, some of the suspects had started consulting witch doctors and another was trying to leave the country. The NIC has recently sacked or suspended 30 of its staff and 40 of its agencies have had their services frozen. It is estimated that the NIC has lost some Shs 2 billion. It is also reported that 120 policemen have been sacked for taking bribes between January 1998 and June 1999; 132 others have been transferred to other duties. The Police Officer commanding Rombo district was suspended in May. A TANESCO auditor has been suspended following his alleged failure to report irregularities in the issue of cards for the payment of electricity which caused losses amounting to millions of shillings. On May 22 President Mkapa announced the appointment of new chairmen, general managers and directors general for seven agricultural parastatals. On May 22 ten medical personnel including six doctors were suspended. The Acting Director of the Tanzania News Agency was retired at the same time. On July 6 according to the Daily News, President Mkapa retired ‘in the public interest’ the Deputy Commissioner of Police in Zanzibar and the Chief Administrative Officers in the Vice-President’s and Prime Minister’s Offices. The Zanzibar Commissioner of Police was ‘given other duties’. No reasons were given for these latter actions. The New York-based Human Rights Watch published on July 7 an informative but highly critical 36-page report under the title ‘Refugees in Tanzania Confined Unfairly’. The report said, inter alia, that tens of thousands of refugees, some of whom had lived in Tanzania for more than two decades, had been rounded up by the Tanzanian army and confined to camps for the past year in the western part of the country. ‘The army separated the refugees from their families and stripped them of their belongings in an indiscriminate response to security risks from outside the country’ the report said. The army conducted sweeps largely in late 1997 and early 1998 on the grounds that it was necessary to protect Tanzanian citizens living near the Burundian border. The Burundian government had alleged that Burundian Hutu rebels based in Tanzania were engaged in arms trafficking and cross-border incursions; it threatened to act if the Tanzanian government did not. With little or no notice the Tanzanian army then swept through villages close to the border apprehending thousands of refugees from the homes in which they had settled and developed new lives, and sent them to refugee camps. They had lost personal belongings and their schools and community institutions had been closed. The government said that the Refugees Act stipulates that refugees must be taken care of in a particular area and not mixed with citizens. Those complaining of loss of property and separation from their families had been asked to submit their claims but none had done so. By contrast, at the beginning of June a visiting French delegation praised the government for the care being given to refugees in Kigoma. And on July 14 the Guardian revealed that Tanzania (and the Cote d’Ivoire) had been made the first recipients of the 1999 OAU Medal for ‘Outstanding Service to Refugees and Displaced Persons in Africa’. At the budget session in parliament on July 9 Home Affairs Minister Ali Ameir Mohamed said that the 20,000 refugees remaining from the original 500,000 who came from Ruanda, most of whom went home in 1996, must now also return home. Many were still in Ngara pretending to be Burundians. Tanzania still had 800,000 refugees from eight countries, mostly from the Congo and Burundi. Hailed as a ‘Gift from God’ a five-year old Tanzanian boy, Sheikh Sharifu, who was described in the London ‘Sunday Times’ (quoting the Tanzanian Swahili newspaper Majira) as having ‘a cherubic face, a falsetto voice and an uncanny ability to recite religious verse’ has been visiting West Africa. Describing his appearance in mid-May before 60,000 people at the National Stadium in Dakar under the heading ‘Paroles de grand, gestes de petit’ the Senegalese newspaper ‘Le Soleil’ wrote about this ‘young protege, from far away Tanzania’, about his ‘assurance deconcertante’ and how the vast crowd had left the gathering ‘visibly convinced’. He was said to have been dressed in a ‘basin mauve surmonter d’une djellaba noire, la tete couverte par une cheche rouge et d ‘un turban rouge et blanc’. His arrival at the stadium was heralded by sirens and loud salvoes of Allahou Akbar. So that he could be better seen by the vast crowd the boy stood on a gold-leafed throne. Young Sheikh Sharifu has also been taking other parts of the African continent by storm. In the Sunday Times article it was said that he had been preaching to enthralled Muslims in 14 African countries altogether and to have been received by Colonel Gadaffi and the heads of state of Senegal, the Gambia and Benin. The head of a Senegalese Islamic Foundation that sponsored the visit said that “he wasn’t a prophet in the traditional sense but his arrival in Senegal offered us a different face of Islam: the face of an angel who comforts our faith”. In Abidjan, Cote d’Ivoire, according to the Sunday Times, he was presented with a new BMW car. But a few days after these events, it was noted that he made several mistakes in reciting the Koran and gave the impression of having learnt the verse by rote rather than through divine inspiration as his uncle Wazir, with whom he was travelling, claimed. As he was leaving for New York, where he was scheduled to preach at the Malcolm X Mosque in Manhattan, he and his uncle seem to have disappeared. The boy is suspected of having become what the Sunday Times described as ‘the possible victim of a tawdry millennial scam that has embarrassed several high ranking Imams and left: countless African believers mourning the death of a dream’. In Dakar there were calls for the Chief Imam and the Director of National Television to resign. There was talk of Senegalese being ‘taken for a ride’ by an unscrupulous Tanzanian. (Thank you Liz Fennell in London and Badou Diop in Dakar for sending this information -Editor). Karibu sana katika Kisa ya Kisasa tunapo kabiliana na maneno mapya na vichekesho vya kilugha. Welcome to the modern story where we confront new words and funny phrases. Mgoso agundua ulimi hauna mfupa! -The white person (Mgoso) understood that the tongue has no bone. My first time in Dar-es-Salaam (Mzizima). I thought my Swahili was pretty good. I had spoken to this woman several times on the phone but never met her face to-face (ana kwa ana). How to express to her that this was the first time we had met ‘in the flesh’? I proudly announce that I was pleased to meet her bodily (kimwili) for the first time; with all the implications that you would expect of such a phrase. I thus learnt a valuable lesson and a useful proverb: the tongue doesn’t have a bone (ulimi hauna mfupa; i.e. it is incontrollable). This is an acceptable phrase for excusing those numerous faux pas. Jamaa agoma kuondoka kizimbani -the man refused to leave the dock (in court). Jamaa mmoja alishitakiwa kwa kuiba vitu vyenye thamani ya kilo tatu. Alimwambia hakimu kuwa bora afungwe jela kuliko kuja mahakamani kila siku. Mtu huyu alichoka na ‘njoo kesho’ za mahakama kwa sababu mlalamikaji hafiki mahakamani. Baada ya kugoma kuondoka iliwabidi maafande wamtoe nje kwa nguvu, ndipo alipofunguliwa shitaka lingine la kufanya fujo mahakamani. Aidha hukumu ya kesi hiyo haitatolewa mpaka mwisho wa 1999! The man who refused to leave the dock in court was charged with theft of goods to the value of 300,000 sh. (kilo tatu). He asked the judge if he could be imprisoned instead of the constant postponements of the court (njoo kesho, lit. come tomorrow). After striking out and refusing to leave, the police (maafande: cops) had to remove him by force. This led to the opening of a new case, that of ‘creating a disturbance’ (fujo) in court, the judgement of which will not be announced until December 1999! Kilo has come to mean 100,000 shillings ie. the same as ‘laki’. Maafande is a common word for the police; it’s in the dictionary. ‘Njoo Kesho’ means come tomorrow, it is used here as a noun; postponings. Fujo is what English soccer fans are famous for; disturbance. It is used to describe strikes as well as violence. BRITAIN -to increase its aid from £42 million in 1997/98 to £63 million in 2001; it has also provided recently $867,000 for anti-malaria research in East Africa particularly the problem of resistance to anti-malarial drugs and Shs 10 million to sponsor a ‘mock’ parliamentary session in which the participants were 150 students from secondary schools around the country. SWEDEN -$8.6 million for the rehabilitation of the Ubungo Power Station in Dar es Salaam. DENMARK -Shs 400 million to renovate the former Kivukoni Magistrates Court building to accommodate the new Tanzania Commercial Court and Shs 55 billion over five years for the health sector. JAPAN -Shs 8.4 billion for the Dar es Salaam Roads Improvement Project and Shs 3 billion to purchase rice to alleviate food shortages. ITALY -Shs 11.5 billion to pay for the contract already signed for the 43-km Wazo Hill to Bagamoyo road. Italy has also promised to help sponsor the preservation of historical sites in Bagamoyo. The BRITISH FOREIGN LEGION ~-Shs 3 million to be divided amongst 64 Tanzanian World War II veterans. CHINA -Shs 9 million for air conditioners for the National Archives. FINLAND -a further Shs 1.8 billion for the East Usambara Catchment Forestry Project and Shs 500 million to strengthen the Tanzania Revenue Authority. WORLD BANK -$117 Million aimed at doubling Dar es Salaam’s water supply including funds for the purchase of 100,000 water meters. NETHERLANDS -Shs 52 billion to be disbursed in this year for health, women and good government programmes. The FRANKFURT ZOOLOGICAL SOCIETY -Shs one billion for the Serengeti National Park. SOUTH AFRICA -four Puma helicopters for the army’s disaster rescue unit ‘in appreciation for Tanzania’s help in defeating apartheid’ -the Daily News. Two recent, fine, contrastive exhibitions in London’s premier art district showcased work by three established artists from Tanzania: Robert Glen, Georges Lilanga and Sue Stolberger. The first was ‘Contemporary African Art from the Jean Pigozzi Collection’ at Sotheby’s; the front cover of the illustrated 132-page catalogue shown here is a reproduction by Tanzanian artist Georges Lilanga di Nyama at the exhibition entitled Uishi na jirani zako vizuri ili ukipatwana shida watakusaidia (maintain good relations with your neighbours so they will help you when you are in trouble) Acrylic on plywood 1992. The second was ‘Robert Glen and Sue Stolberger: Tusk Trust Exhibition’ at the Tyron & Swann Gallery in Cork Street in London. There was a 14-page illustrated catalogue. With East African childhoods, the three artists describe themselves as self-taught, that is without an academic art education; nonetheless Glen and Lilanga have at times run their own workshops. It was a rare opportunity during one week to see familiar kinds of Tanzanian art -European wildlife naturalism and Makonde social imagery. Tyron & Swann, a commercial gallery that specialises in natural life subject matter, showed some 50 objects comprising 14 bronze sculptures by Glen and 37 water-colour paintings by Stolberger. Their realistic art is inspired by the ‘uninhabited wilderness’ of Ruaha National Park, their home and studio for the past five years. Their works are complementary. Stolberger’s paintings express the changing scene –dry environment, big skies and also the small, designer details of animals and birds (often depicted together, like Robin A’s batiks from Nairobi). Glen’s sculptures fill out the space with the eternal gestures of animals; bronze is permanent and such objects exude a powerful presence. Glen’s mastery of subject and medium are superb; it makes me wonder about links to his original profession of taxidermy -in the 60’s. The Sotheby’s exhibition, in contrast, was a group show of Contemporary African Art from the Collection of Jean Pigozzi and part of their first ever auction in this genre (Sotheby’s expertise is African ‘tribal’ art; Pigozzi’s Collection has been shown in the UK previously at prime Modernist white walled venues such as the Saatchi, Serpentine and Tate, Liverpool; ironically the gallery walls were painted mud brown). The show of 28 artists featured four paintings inclusive of the catalogue cover. Georges Lilanga di Nyama who was born in Masasi and is a practised Makonde carver, co-founded the Nyumba ya Sanaa (House of Art) in Dar es Salaam in the early 70’s. His major achievement is the transformation of Makonde shetani (spirit) imagery into two-dimensional forms for prints and paintings; a touch of nationalism is his insistence on Swahili titles. He acknowledges ‘Tinga Tinga’ (Eduardo Saidi 1937-72 at Morogoro Stores) who introduced him to painting with domestic paints on square, plywood boards. I find Lilanga’s imagery is more original, organised and dynamic than that found on most ‘square’ paintings. The auction sales were successful beyond predictions; only one of 57 works did not ‘go’. Lilanga’s paintings fetched between £6,000 -£8,200 (3 to 4 times the asked price); the average was £4,000 and the highest price was £11,200. 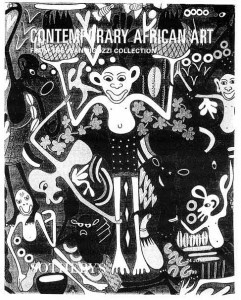 For me, viewing these works was evocative, recalling work in and visits to Tanzania while also affirmative of the ongoing contribution of art to cultural identity, if not development. Indeed, for both venues, percentages of the proceeds are being shared; from the Tyron & Swann Gallery with the Tusk Trust and Friends of Ruaha Society and from the Sotheby’s Pigozzi auction with UNICEF and an artists’ fund. Maendeleo na Sanaa.